Get ready for the #1 touring Tribute show in Canada. 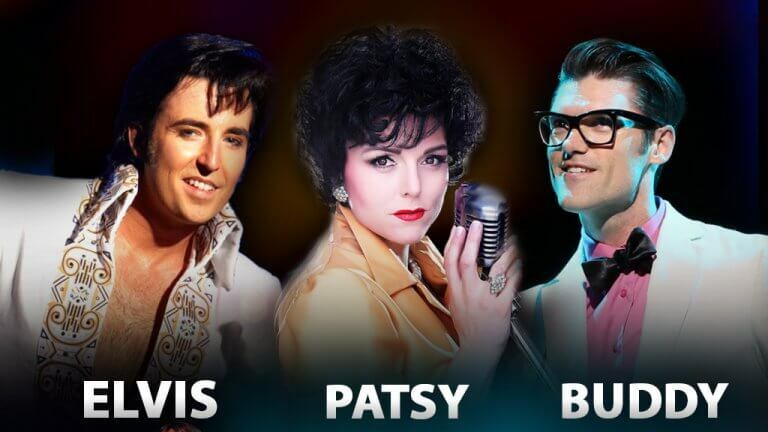 Legends Show will feature the most incredible tributes to Buddy Holly, Patsy Cline, Elvis Presley, and Motown. Accompanied by Toronto's Rockin’ Royals Band. Performing as Buddy Holly, Zachary Stevenson direct from Vancouver, and the headliner from Internationally acclaimed “Buddy Holly Story”, has been playing the starring role as Buddy Holly in over twelve different productions of the “Buddy Holly Story” across North Ameria. Hear all of your favourites such as: That’ll Be The Day, Peggy Sue, Maybe Baby, Oh Boy, and many more. Zachary will keep you rockin’ in your seats with his amazing performance. Canada’s tribute queen Amberley Beatty will make you “fall to pieces” with her incredible look and sound as she portrays one of the greatest singers in the history of country music the late Patsy Cline. In her beautiful gown, bright red lips, and sultry sound, hear all of your favourites such as: Crazy, I Fall To Pieces, Walking After Midnight, and many more. You will be taken back to the 50’s with the incredible talents of Amberley. The stars of “Motown Soul”, Cathy, Marlene and Amoy known as The Tonettes, have been blessed with power, sensitivity, and vocal energy. This sensational trio will be performing a variety of songs from the music of Diana Ross and The Supremes, Aretha Franklin and many others. A performance not to be missed. As Elvis, Pete Paquette is a world-class Elvis tribute artist that is able to perform all eras of the King’ career: 50s, 60s, and 70s. Known for captivating his audiences through his incredible voice, high energy, charisma, and playful spontaneity with his audiences. Hear all of your favourites such as: Jailhouse Rock, Return To Sender, Suspicious Minds and many more.